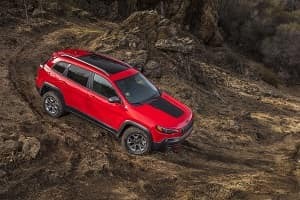 2019 Jeep Cherokee SUV features and specs | Orchard Chrysler Dodge Jeep Ram " "
We’re proud to offer the 2019 Jeep Cherokee here at Orchard Chrysler Dodge Jeep Ram. Just like many Jeep SUVs from the past, this vehicle is able to take you on some amazing adventures. 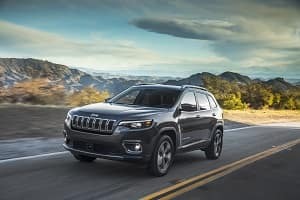 If you know anything about the previous generation of the SUV, the Jeep Cherokee is also comfortable and efficient enough to make driving around town enjoyable. As your Jeep dealer in Washington, MI we have a solid selection of new Jeep vehicles. Contact us to arrange for a test drive. How any vehicle performs is key to how much you enjoy it. With the 2019 Jeep Cherokee you get the winning combination of excellent performance, advanced efficiency, and rugged capability. You get to choose one of three available engines. A base 2.4-liter Tigershark MultiAir 2 uses advanced technologies like a flow-control valve intake manifold to optimize fuel efficiency without sacrificing performance. With the 3.2-liter Pentastar V-6 you get excellent power, plus an engine stop/start for city use. Providing the best balance of power and efficiency is the all-new 2.0-liter turbocharged four-cylinder engine, putting 270 horsepower and 290 lb.-ft. of torque at your command. Three different four-wheel-drive systems are available for the Jeep Cherokee, providing excellent trail and inclement weather capabilities. Jeep Active Drive I has a rear axle disconnect for excellent fuel efficiency. Jeep Active Drive II adds a low range plus neutral mode, taking you adventuring to the next level. The final system, Jeep Active Drive Lock, adds a rear locker for improved traction in challenging terrain. If you want the ultimate in off-road performance, choose the Jeep Cherokee Trailhawk. This Trail Rated model comes with a setup for optimal traction, maneuverability, water fording, ground clearance, and articulation. Just because you want a capable and more utilitarian vehicle doesn’t mean you hate modern technologies. Thanks to a solid offering, the 2019 Jeep Cherokee combines all of these elements into one. What’s more, the standard and available modern systems are designed so anyone can use them. Many of the technologies work to make your safer. Blind spot monitoring and rear cross-path detection use radar sensors to detect other vehicles you might not otherwise see. Another example is the LaneSense lane departure warning, which provides visual and audio warnings when start drifting out of a marked lane. Other technologies address your need for information, connectivity, and entertainment on the move. The various Uconnect systems can add features like Apple CarPlay, Android Auto, the SiriusXM All Access Package, navigation, and Bluetooth. While the Jeep Cherokee technically is a small SUV, smart engineering and design make the interior quite large. That means more space for you and your passengers to stretch out and get comfortable. You’ll also find plenty of room for gear, so you can accommodate surprises in life without stressing. Both rows of seating feature plenty of legroom and headroom. You can add to that leather upholstery, front seat heaters, and a dual-pane panoramic sunroof. Learn even more about the 2019 Jeep Cherokee by scheduling a test drive through Orchard Chrysler Dodge Jeep Ram today.